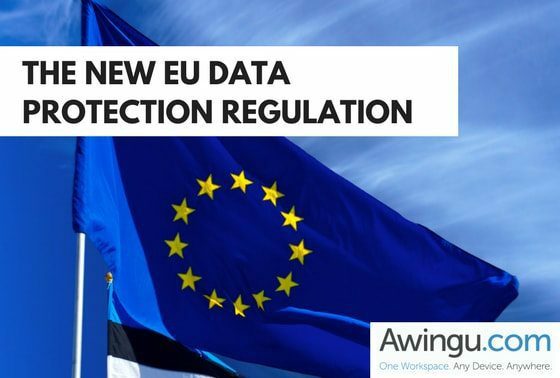 The new General Data Protection Regulation (GDPR) will take effect on the 25th of May 2018. This regulation has the goal to protect the European citizen’s personal data. This should be achieved by regulating what information is stored and how it’s processed on one hand and by improved security measures on the other hand. GDPR applies to all: Any company that works with information relating to EU citizens will have to comply with the requirements of the GDPR. GDPR widens the definition of personal data: The GDPR considers any data that can be used to identify an individual as personal data such as generic, mental, cultural economic or social information. GDPR makes the appointment of a DPO (Data Protection Officer) mandatory for certain organizations: The GDPR requires public authorities processing personal information to appoint a data protection officer (DPO), as well as other entities, when “core activities” require “regular and systematic monitoring of data subjects on a large scale” or consist of “processing on a large scale of special categories of data”. GDPR introduces a common data breach notification requirement: The GDPR harmonizes the various data breach notification laws in Europe and is aimed at ensuring organizations constantly monitor for breaches of personal data. GDPR introduces the right to be forgotten: The GDPR introduces very restrictively, enforceable data handling principles, said Kinast. One of these is the data minimisation principle that requires organisations not to hold data for any longer than absolutely necessary, and not to change the use of the data from the purpose for which it was originally collected, while – at the same time – they must delete any data at the request of the data subject. GDPR expands liability beyond data controllers: “The GDPR also covers any organization that provides data processing services to the data controller, which means that even organizations that are purely service providers that work with personal data will need to comply with rules such as data minimisation,” said Kinast. GDPR requires privacy by design: All software will be required to be capable of completely erasing date, which will be a challenge for a lot of software engineers. GDPR introduces the concept of a one-stop shop: In the past, Ireland has been popular with large US corporations, such as Google, because of the country’s relatively permissive data protection authority, said Kinast. “However, that all disappears with the GDPR, which allows any European data protection authority to take action against organizations, regardless of where in the world the company is based,” he said. No local footprint: Since Awingu runs completely in the browser there is no local footprint on the end device. Files and applications remain in the safe realm of the enterprise. Due to this nature, we have automatically increased protection against (ransomware) viruses. Eliminating the need of Shadow IT: Awingu allows to share files and applications and enabling bringing this to any device. Audit logs: Awingu keeps track of logins, application sessions, connected SaaS sessions allowing to detect anomalies and alert in case of. Want to read more about this topic? Download here our whitepaper “Get ready for GDPR”. In case you have any questions on how Awingu can help your organization to comply with the regulation, please do not hesitate to contact us.